The company reports quarterly net income of $24.2 million, or 59 cents per share, missing analyst projections of 67 cents per share. The financial results come just days after Big Lots announced that Bruce Thorn will become chief executive officer. A customer exits a Big Lots store in Clifton, New Jersey. 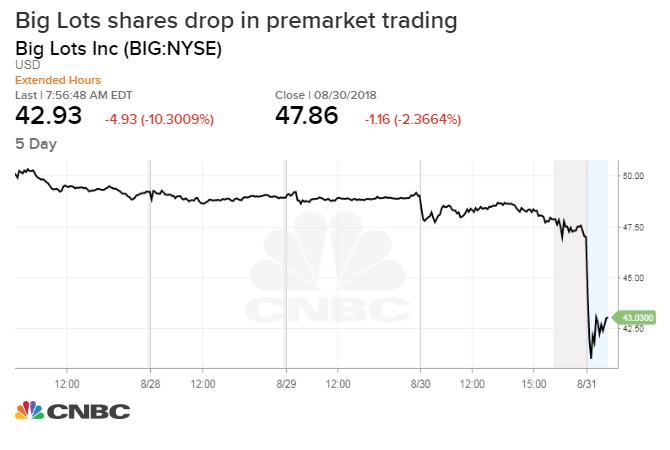 Shares of Big Lots plunged Friday after the discount retailer reported second-quarter earnings that fell short of Wall Street expectations. The company's stock dropped more than 9 percent, adding to its 14.7 percent decline this year. The Columbus, Ohio-based company reported quarterly net income of $24.2 million, or 59 cents per share, missing analyst projections of 67 cents per share. It also posted revenue of $1.22 billion in the period, which fell just shy of expectations. For the current quarter ending in November, Big Lots sees its earnings per share in a range from a loss of 6 cents per share to a gain of 4 cents per share. The financial results came just days after Big Lots announced that Bruce Thorn will become chief executive officer. Thorn, 51, who is expected to formally take the reins in September, was most recently president and chief operating officer at Tailored Brands, a specialty retailer of men's clothing.